I am assembling file server for home use. I wonder if it is possible to use multiple disks in a way that they will be visible in network as one continuous space? More less like JBOD. I am using SATA disks, NTFS formatted. Can I achieve this by symbolic links? I mean setting up links from 4 disks to one folder that is sheared? Or there is some way to mach all 4 disks with JBOD on system level and expose this space to the network? Can I setup JBOD when two disks are on different controller than other two? Usage: Usually one user reading/writing data, basic access rights model (like one from Windows) is ok. Note: I would prefer to stick with Windows+NTFS rather then using FreeNAS+ZFS. After reading all answers and comments I decided to use Dynamic Disks and go with Raid 5. The reason why I decided this in first place was to solve problems with my main computer and its constant disks consistency checks, lost files or even partitions so RAID 5 it is. For now I will stay with software RAID and I will see how it works for me. If I performance will be an issue I will switch to hardware RAID as Zoredache and Molly suggested. If you convert the disk to Dynamic Disks (go to Disk Management in your System Management, right-click the disks and choose "Convert to Dynamic Disk"), you can then create a new "Spanned" volume. Windows will then join all of your disks together into one logical volume. Note however that you get zero redundancy with this method of joining the disks, so if you lose one disk you lose the lot. What you can do is go to computer management then disk management. Convert all of them to Dynamic disks and then you should be given the option to create a new Raid 0 / spanned disk that will achieve what you want. That being said,I highly recommend against this unless you have a good backup plan. I personally have 4x 1TB drives and use them as 2x 2TB raid 1's (although recently been thinking about just using them as normal disks with rsync or similar between them). And remember, even if you go for the above, always backup your important files. Lastly, unless you have a Technet / MSDN subscription and a number of licences, Windows server 2008 can be expensive. Although I have a Technet, I use Freenas and CIFS. I am VERY happy with it. One option is to set them as RAID 0. Being all of the same size, this means the final volume will be 4 x minimum size, or 4 x 1TB. 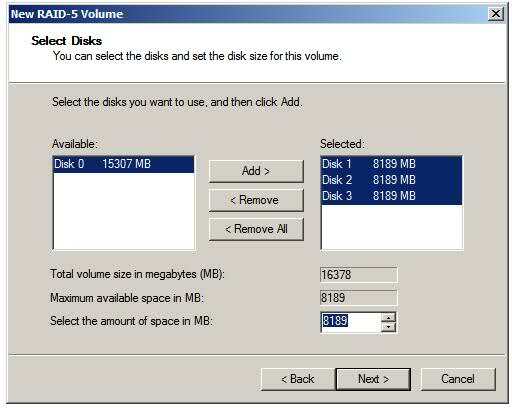 Look up Dynamic Disks and Spanned Volumes in Disk Management help. This should allow you to do what you need; I don't know the details, though. As Zoredache says, you'd be safer with a RAID5 volume (which I think can also be set up using dynamic disks) -- but as always, RAID is not a backup! RAID0 is what you're looking for in this scenario, though you may need a hardware RAID controller to make it all work. In that setup the RAID controller would take all of the disks and turn them into a single logical drive that the operating system would see. The entire thing becomes one large block of space. The problem is that if one of the member drives in the array fails, the entire array fails and becomes inaccessible. I've seen people use RAID0 arrays for doing temporary work such as video editing and the like, but never for long-term storage because of the dangers involved. Tread with caution if you take this road. If you substitute Windows Home Server in place of Server 2k8, you can use Drive Extender. Shared Folder Duplication supports reliability by duplicating designated shared folders. Important data is stored on separate hard drives, which provides protection against hard-drive failure. Makes hard drives and their content easy to move It is easy to remove outdated hard drives. You can store the content on other hard drives in the system and remove old or small hard drives. The "redundancy" that RAID was designed for was for high availability servers. Unless you're going to lose $$$ for downtime, you're better off with a conventional backup scheme. Drive extender copies files to separate hard drives for redundancy of only the folders you select, rather than wasting a whole drive on parity bits. Windows Home Server is also cheaper, USD 92 @ newegg. It shares the same core as Windows Server 2003 but modified for the home. For example, you can't run Exchange, but I don't think you're going there. Windows (now) can mount volumes into folders instead of drive letters, just like UNIX does. Each folder then corresponds to a separate drive. Not the answer you're looking for? Browse other questions tagged windows-server-2008 nas storage windows-server-2008-r2 or ask your own question. Do 7.2k SATA drives and a hardware raid controller always end with trouble? Home ZFS based NAS…What processor/chipset to use? How important is the 1GB RAM per 1TB disk space rule for ZFS? What is the best way to setup separate FreeNAS jails/plugins using separate datasets? Migrating disks from one NAS to a new one (Synology)? What filesystem and backup strategy for a small-scale home server?